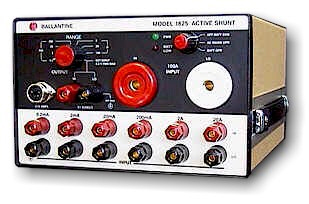 The BLI 1625A is a multiranging, high accuracy, active current shunt, for use in making NIST traceable measurements of currents from 10 microamperes to 100 Amperes. Very high measurement stability has been achieved in our shunt design by using special alloys, compensated by a proprietary Ballantine process to minimize temperature coefficient effects. Basic Accuracy ± 0.01% DC; 0.1%AC. Bandwidth DC to over 10kHz.